Have your next golf outing at Shawnee Hills in Bedford Reservation! Challenge yourself to hole #4, the toughest in Cleveland Metroparks Golf. In 1989, Shawnee Hills in Bedford Reservation expanded to 27 holes, including an 18-hole regulation course and a 9-hole Par 3 course. The original 18 holes were designed by local architect Ben Zink in 1957. Zink, a golf course superintendent at Acacia and Kirtland, designed Berkshire Hills in Chesterland and the former Landerhaven Golf Course in Mayfield Heights. The expansion of the course was designed and constructed by Cleveland Metroparks staff with the exception of "gorge holes" #11 and #12. From the original 9-hole regulation course, only four holes remain intact. Shawnee Hills is the most versatile course in Cleveland Metroparks. Lessons are available and players can practice on the 29-station driving range. Beginners can enhance skills on the sporty Par 3 course. At the 18-hole course, the front nine with its gentle rolling terrain and water hazards has been likened to a "Florida" course. The challenging back nine with its hills and large pines, maples, oaks, and beautiful Deer Lick Creek, is reminiscent of a course in the Carolinas. As you walk down the hill from the #10 green to the #11 tee, take note of the grave site of Mary Egbert. The Egberts farmed the land that most of the course was built on. Mary was one of the Egbert sisters and died at the age of three in 1843. The most difficult hole at Shawnee Hills, and possibly the toughest hole in Cleveland Metroparks, is #4. It is a converted par 5 hole, now a 469 yard uphill, tree-lined, dogleg left par 4. 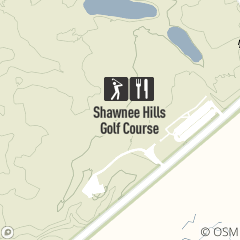 The best feature of Shawnee Hills is its versatility. Players can enjoy the game no matter what the skill level. "I believe that evaluating each of my student's physical capabilities is essential in designing and delivering an effective teaching plan."